The Scampy Team is heading to the Town of Sandpoint. We have a bunch of packages to pick up there at Sandpoint Pack and Ship. It's stuff that we bought. One of those things waiting for us is our replacement screen door. We have been missing that screen door sooooo much! 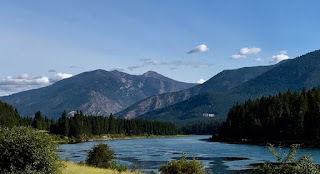 the Clark Fork of the Columbia River. Something has gone wrong with the way that I connect to the internet. I no longer have a Personal Hotspot. Right now I am connected to the Net using a Safeway Store Free Wifi. I've used Apple Support and T-Mobile Support to resolve this issue. Nothing worked! George, if that blue hose is for the tank vent, I can see why the original hose was as the auto parts guy described "like a vacuum" hose. I think some sort of a flexible hose would be better suited for your application and would put less stress on the hose fittings. The smaller clear colored hose is the tank's vent. The blue hose is the water filler tube. Hey George: May as well ad my 2 cents worth. My fresh water tank inlet cracked at the outside fill inlet. The hose was too short to recut, so I went to the hardware store, they had two similar choices, neither of which worked. I ended up going to an RV dealer/parts and they had the hose on hand. I looks similar but the RV part is much more flexible, went on easy and has stayed tight. Also, when you securted your fresh tank it looked like a cable or rope was over he one end. I think you should ckeck this too make sure it is not rubbing a hole in your tank. I know you put something under it but I would still look at it. I will re-check to make sure the hold-down cable is not in contact with the plastic tank. Why doesn't the blue hose fit all the way on the fitting? I am working on making the blue hose go farther down the tank fitting. Hi George, while you're making final adjustments on water filler line to square it up, I suggest you double clamp both ends. yes, thats a marine industry standard for anything below the water line on a boat but it only takes a minute and will insure you dont "get loose" from road vibration, expand-contract etc.. might as well do other one also. you know, the non essential vent line :). couldn't resist. love ya George. Thank you. It's a good thing to be loved! Seems like a vent fitting should be at the top of the tank and also be the overflow in case you overfilled your tank. From you pic it looks like they are right next to each other and both below the water line on a partially filled tank. Thanks for your comment. You are correct. And, both fittings are located at the top of the top of the tank.